Every year, the Mediator drafts a report on his work, which describes the outcome of the requests received, the assessment of the cases handled and a detailed account of the recommendations made. “This annual report represents the showcase of our impartiality and the proof of the transparency of our mediation activity vis-à-vis all applicants,” says Jean-Pierre Hervé. You can access the flick-through pdf by clicking on the following link: link. The number of mediations carried out within the ENGIE Group once again progressed: up 17% compared to 2016, rising from 339 to 395, all markets and business units combined. 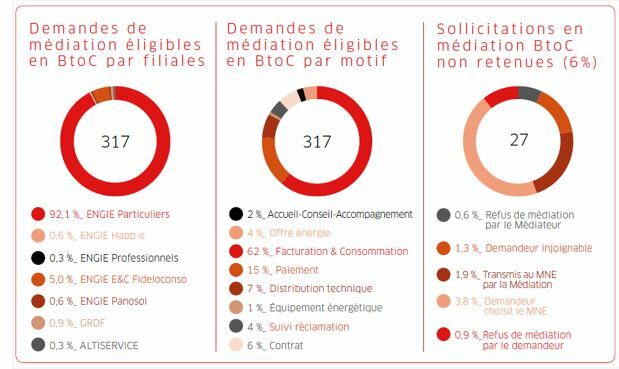 93% of the mediations concerned B2C customers (private individuals) in the field of energy, or 366 applications out of the 395 received. As in 2016, the total number of applications to the Mediator increased in 2017, reaching 5,986 requests (up 94% compared to 2016 and 131% compared to 2015). 89% of B2C opinions issued during mediations were accepted by the parties and implemented. In addition, mediation is a process which is both fast and effective: the median case processing time was 59 days (requirement of law – order of 20 August 2015 in France – to process in less than 90 days), times to be compared with that of a judicial proceeding. 85% of applicants were satisfied with the Mediator’s action versus 75% in 2016. The improvement in satisfaction was mainly due to the commitment shown by the Mediation team to resolving the requests, while complainants were more demanding. Once again this year, most of the requests received and mediation processes carried out concerned customers’ comprehension of bills, regularisation of amounts further to incorrect meter readings or adjustments to meter readings following meter failures. Since 25 February 2016, the independence of the ENGIE Group’s Mediator has been confirmed: he has been accredited “Consumption Mediator” by the CECM or (State) Commission for Evaluation and Control of Mediation and his report meets the criteria set out in the French Consumer Code (Order of 20 August 2015). He is on the list of mediators approved by the European Commission. Further to the various disputes he examines, the ENGIE Group’s Mediator makes recommendations to the ENGIE group entities concerned. These recommendations suggest areas for improvement in the handling of customers and their requests, in procedures and in the services offered. These are specified each year in the Mediator’s annual report. The Mediator then works with these entities to ensure his recommendations are followed through. In 2017, the Mediator was able, based on the particular cases he encountered during his working year, to make 13 recommendations (vs 11 in 2016). They were discussed with the ENGIE Group business units concerned to ensure their implementation, as well as with consumer organisations. The details of the recommendations are presented in the activity report on the Mediator’s website. Recommendation 4:“On a bi-monthly bill, the wording in the box on the first page ‘Your billed usage’ is incorrect in some cases”. You can access the flick-through pdf by clicking on the following link: : lien. The number of mediations carried out within the ENGIE Group once again increased: up 11% on 2015, rising from 306 to 339, all markets and business units combined. 93% of mediations concerned B2C customers (private individuals) in the field of energy, or 317 of the 339 requests received. After declining three years in a row (2013 to 2015), the total number of requests to the Mediator rose in 2016 to 3,093 (up 20% on 2015). 85% of the opinions issued during the mediations were accepted by the parties and implemented. In addition, mediation is a fast and efficient process: the median case processing time was 64 days (requirement of the law – order of 20 August 2015 in France – to process in less than 90 days), times to be compared with that of a judicial procedure. 75% of applicants were satisfied with the Mediator’s action versus 70% in 2015. The improvement in satisfaction was mainly due to the commitment shown by the Mediation team to resolving the requests, while complainants were more demanding. Since 25 February 2016, the independence of the ENGIE Group’s Mediator has been confirmed: he has been accredited by the Mediation Evaluation and Control Commission (CECM) as “Consumption Mediator” and his report meets the criteria set out in the French Consumer Code (Order of 20 August 2015). He is on the list of mediators approved by the European Commission. After this report was published, the press reacted. Consult articles published in the press by clicking the links below. ENERPRESSE– 15/06/17> 20% rise in requests made to the mediator of Engie France. 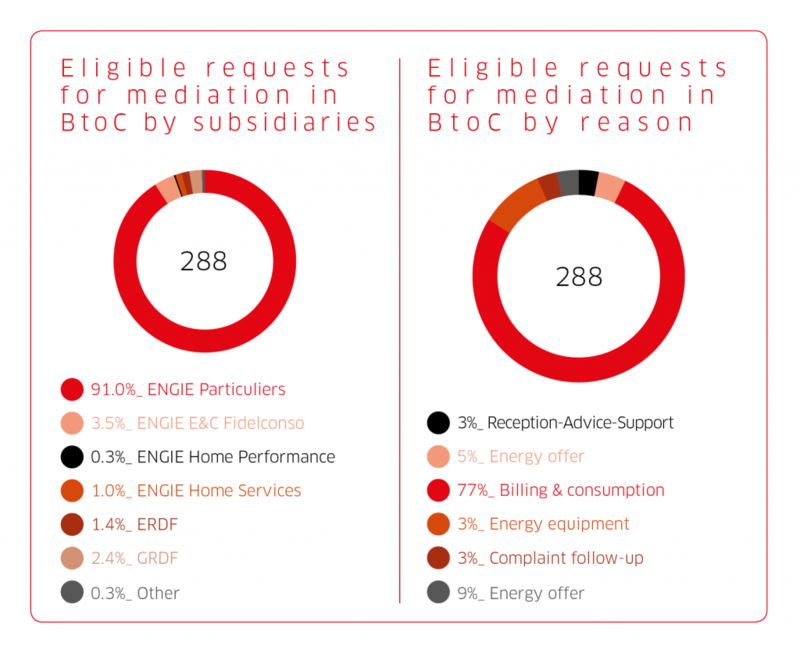 20% rise in requests made to the mediator of Engie France. On 13 June the Engie mediator Jean-Pierre Hervé submitted his 2016 annual report to Isabelle Kocher, the group’s Chief Executive Officer. The number of requests received by the mediator in 2016 was up 20% compared with the previous year (3,093 referrals). In parallel, the number of mediation cases rose by 11%. The average case handling time was 64 days (versus 67 in 2015), whereas the law fixes a maximum period of 90 days. “Once again this year, most of the requests received and mediation processes carried out concerned customers’ comprehension of bills, regularisation of amounts further to incorrect meter readings or adjustments to meter readings following meter failures,” states the press release. As far as outcomes are concerned, 85% of the solutions proposed by these mediation processes were accepted by the parties (92% in 2015) and implemented, while 75% of the complainants said they were satisfied with the mediator’s intervention (against 70% in 2015). Further to the various disputes he examines, the ENGIE Group’s Mediator makes recommendations to the ENGIE group entities concerned. These recommendations suggest areas for improvement in the handling of customers and their requests, in procedures and in the services offered. These are set out every year in the Mediator’s annual report. The Mediator then works with these entities to ensure his recommendations are followed through. In 2016, the Mediator was able, based on the particular cases he encountered during his year of practice, to make 11 recommendations (versus 19 in 2015). They were discussed with the ENGIE Group business units concerned to ensure their implementation, as well as with consumer organisations. The details of the recommendations are also presented in the 2016 activity report. One Mediation case:“Application of the 14-month adjustment in the energy transition law”. 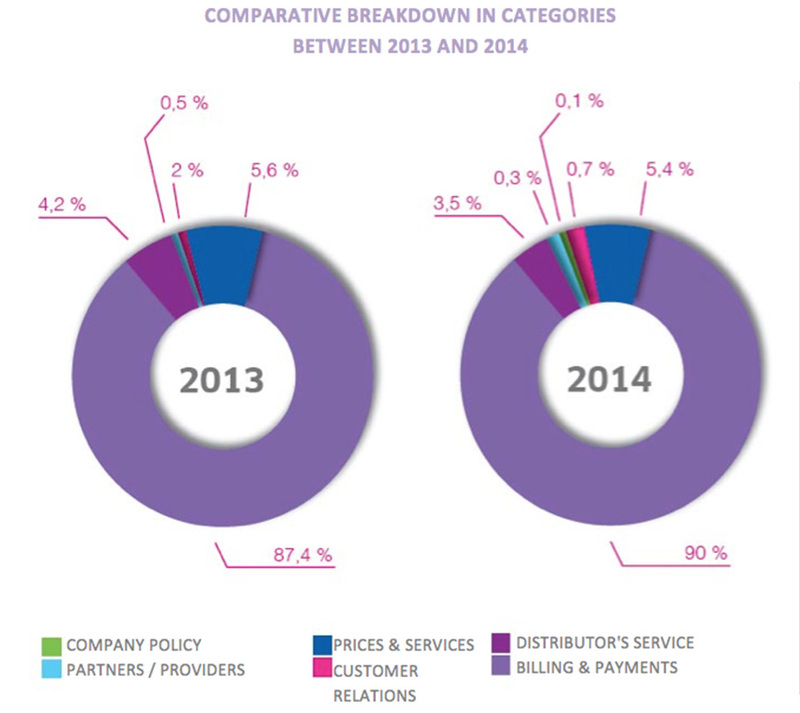 The number of mediations carried out within the Engie Group rose once more: up 54% on 2014, from 199 to 306, all markets and business units combined. 94% of these cases concerned private customers (B2C) in the field of energy. At the same time, the number of requests fell sharply, down from 4,301 in 2014 to 2,588 in 2015. 81% of the opinions issued during the mediations were accepted by the parties and implemented. 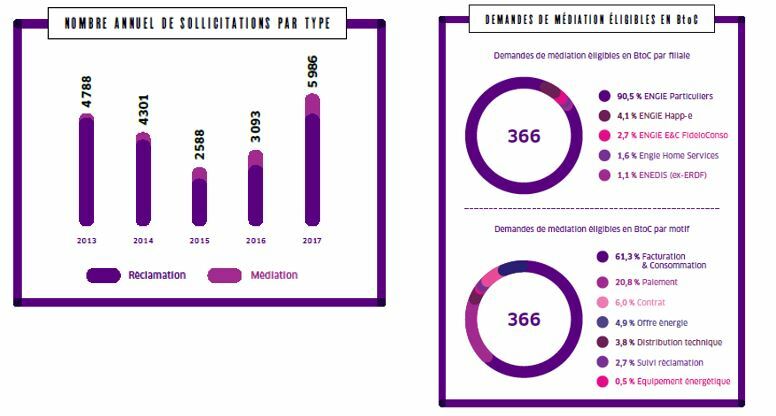 In addition, mediation is a fast and efficient process since 68% of the files were the subject of an opinion within 60 days and 95% within 90 days (requirement of the law – order of 20 August 2015 in France). Once again this year, most of the requests received and mediation processes carried out concerned customers’ comprehension of bills, regularisation of amounts further to incorrect meter readings or adjustments to meter readings following meter failures. The mediation department has noted the emergence of complaints about new services. This is more particularly the case for services concerning boilers and renewable energies. 2015 was also the years of a major change in the regulatory framework for Mediation. The order of 20 August 2015 offered a regulatory framework for consumer mediation, by transposing the 2013 European Directive known as the directive on consumer ADR (Alternative Dispute Resolution), concerning the amicable settlement of disputes. And on 25 February 2016, ENGIE’s mediation system was accredited by the CECM (Mediation Evaluation and Control Commission), as a Consumption Mediator and listed as such on the European Union’s list. A distinction that confirms compliance with all the criteria of independence and efficiency laid down by these new texts. The qualities of ENGIE’s company mediation, inter alia its independence and impartiality, have therefore once again been acknowledged. On 10 June, the Engie Group’s Mediator, Jean-Pierre Hervé, submitted his 2015 activity report to Isabelle Kocher, Chief Executive Officer of the Group. He noted a sharp fall in the number of requests (- 40%) “owing to better performance of the customer service”, and a sharp rise in the number of completed mediation cases (50% more than in 2014). “A trend that is accounted for in part by customers’ more exacting standard vis-à-vis their energy provider, against a backdrop of revolution in the sector, with an increasing number of offers and services,” says the press release. The average case processing time was 67 days, in line with the law, which sets a limit of 90 days. Most requests concerned customers’ comprehension of energy bills, but new claims were recorded, relating to new services, in particular those relating to boilers and renewable energies. More than 80% of the opinions delivered during mediation were accepted by the parties and implemented, whereas special cases led the mediator to make 19 recommendations. In 2015, the Mediator was able to make 19 recommendations based on the particular cases he encountered during his year of practice. They were discussed with the ENGIE Group business units concerned to ensure their implementation, as well as with consumer organisations. You will find in this document a set of examples of mediation solutions in 2015. Of which 4,102 were referred to the customer service departments of the various divisions and subsidiaries concerned and 199 were taken up by the Mediator as a last resort.